We continue to study the moon and have been keen to learn new information. However we realize that the more we learn, the more questions we seem to generate. Our wondering seems endless – kind of like space! 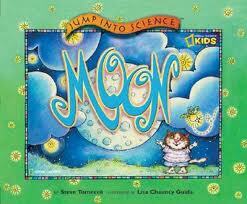 This week we read Moon by Steve Tomecek and illustrated by Liisa Chancy Guida. This is a Jump into Science National Geographic book. First, we filled out an anticipation guide Ms. Gelson had written based on the book. Did we think a list of statements were true or false. For example: 1. Earth is about four times bigger than the moon. 2. The air surrounding Earth helps protect us from falling meteors because it makes them burn up 3. The sun and the moon are about the same size. After this, we returned to our desks to work on sheets that summarized some of our learning. What new things were learned from this book? What questions still exist? Jena talked about Galileo and his telescope. Students were fascinated that this was the first time people had a sense of what the moon actually looked like. 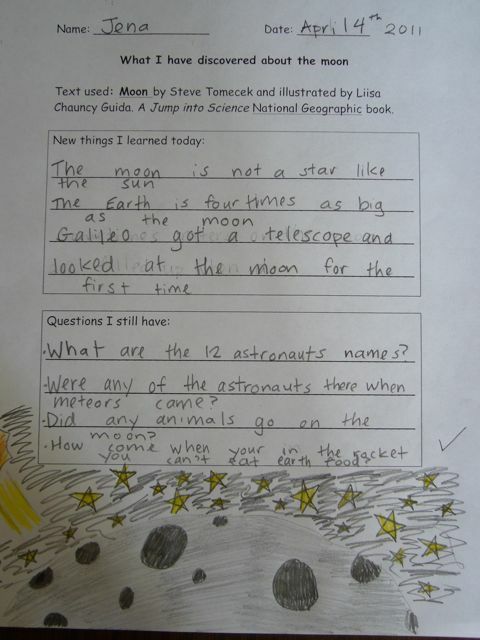 She also noted that the moon is not a star like the sun is. Many people didn’t know the sun is a star. 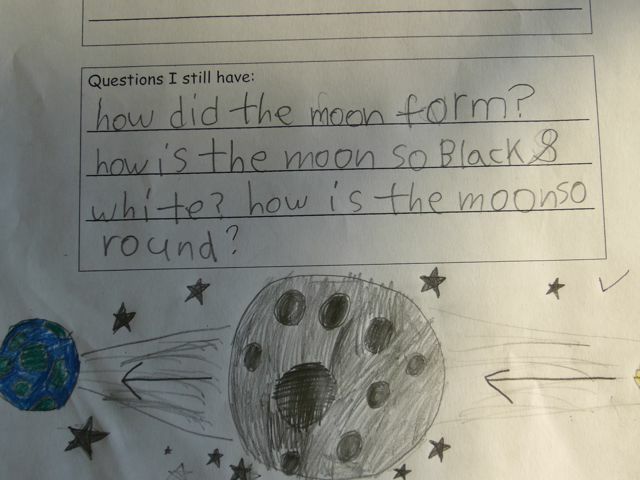 Her questions centred on space travel. What were the names of the twelve astronauts that visited the moon? Did any animals go to the moon? And a very interesting thing to find out: Were any of the astronauts there when meteors came? Jenny thought it was very interesting that the only way a crater can be filled up on the moon is when dust from a new crater forming (from a falling meteor) fills it up. Many students thought that this was pretty cool. Why is the sun so warm? Why can’t there be air in space? 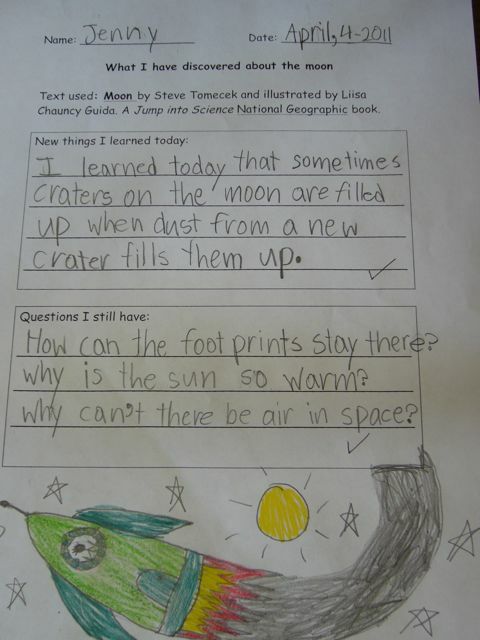 She also wondered about how the footprints from visiting astronauts could remain on the moon forever. It is pretty hard to fathom a place with no wind and no rain. Eddy had some great questions about the moon’s shape and how it formed in the first place. Many students wondered if the Earth and the moon formed at the same time or different times and why we are so connected. Many thought it was strange to talk about ages of planets, moons and stars and wondered if they had birthdays! 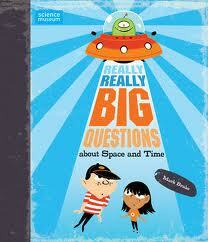 On a quick visit to the library this evening, I found this book: Really, Really BIG Questions about Space and Time by Mark Brake. Illustrated by Nishant Choski. When did the universe start? Why is the night sky so dark? What’s the difference between me, a planet and a star? Do black holes turn you into spaghetti? This entry was posted in Non-fiction and tagged asking questions, great read alouds, moon, non-fiction, picture books, space by carriegelson. Bookmark the permalink.